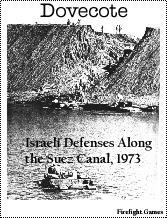 The IDF along the canal in October, 1973, had only 16 of the strong-points manned by a total of only 468 reservists. The armor had been scattered in platoon sized units all along the canal, some 290 tanks. The whole canal length had only 12 artillery batteries for a total of 52 guns. Anti-aircraft defenses were six batteries and two HAWK SAM batteries. The Egyptian Armies consisted of the 2nd and 3rd. A total of 19 infantry brigades, 3 Parachute brigades, 1 amphibious brigade, 4000 artillery guns, 1700 tanks, 2000 APCs, 150 SAM batteries, 400 aircraft, and 2500 anti-aircraft guns! From the standpoint of the Egyptian, one could hardly not think that victory would be easy. Such a disparity of forces! On October 6th, 1973, in typical Soviet manner, the Egyptian Armies fired 4000 artillery guns and in the first minute, over 10,000 shells had fallen on the strong points. There were 52 more minutes to go. As this happened, the Egyptians began to construct crossings across the Suez under air cover also. In addition, 8000 commandos crossed in motor boats. The first wave of men crossed the 180-230 meter canal in seven minutes. Fifteen minutes later, the second assault crossed and for the next four hours it continued and by 8 p.m.(six hours after the start) some 80,000 Egyptians had crossed the canal!! It was David versus Goliath for the next three days. The game comes with two 11x17" map, 280 counters, rules. The map scale is about 1.5 miles per hex. Each combat unit is one platoon to battalion. Turns are 8 hrs. The game simulates the opening few days of the dramatic Egyptian assault across the Suez Canal in October, 1973. The game includes an air game system, a ground system and unique rules where command and control are critical for movement purposes. Use of SAM missiles and SAGGER AT play important roles to keep the Israeli at bay. At first, it appears as a "David vs Goliath" battle because of the disparity of forces. The Egyptian needs to create breaches and bridging and move quickly before the balance favors the Israeli. Time is not a friend to either side at various times in the game. Gunther Bellows 8 5 5 Good game, fair detail, but like a lot of PM games needing that final polish.